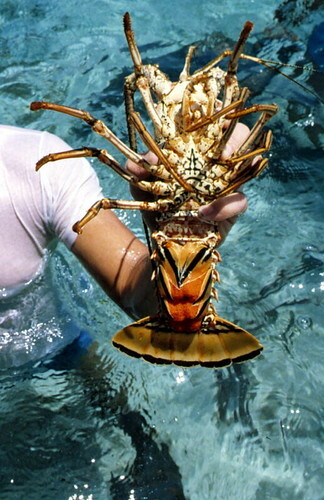 Assuming lobsters have bits. I don’t really want to look that closely. I am a die-hard animation junkie, which has also made me something of a connoisseur when it comes to voice actors. This is helped by the fact that vocal acting is a fairly specialized field and there is a limited pool of actors who deal exclusively in voice work. (This is especially true in anime, where ninety-nine percent are dubbed by the same troup of actors.) All this means that I can usually identify the actor after a few minutes of listening if I’m familiar with their other work. Take for an example the other night. I walked into the living room while GhostDad and Mother Dearest were watching TV and a Cheerios commercial came on. I stood there for a second before speaking. 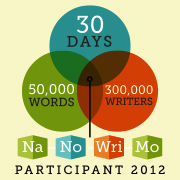 October is fast approaching, which means NaNoWriMo is right around the corner. :pauses for scream: normally by this time of year I’ve at least got an outline ready and have started on whatever research I feel I need to do. However, this year I find myself waffling. My NaNovel from last year, the Cinderella reimagining, is about ninety-five percent complete – but I hate it. While I do love some of the characters, the plot feels forced and clunky and the protagonist, Jinx, is drifting dangerously close to Mary Sue territory instead of being the character I want her to be. I’m at the point where I want to scrap it all and start fresh with a revamped plot. So here’s my quandary; should I try to start something new for NaNo, or redo last year’s work into something I’d be happy to call my own? And then Taco posted his writing challenge and add a whole new wrinkle to things. As soon as I read it a particular fic sprang to mind, just begging me to rewrite it, but that opens up another can of confusion. This fic doesn’t contain any canon characters at all and reads like an original work of fiction rather than a fanfic. This makes me extremely hesitant, since rewriting an original work smacks of plagiarism, even if it’s done in fun. But once an idea gets in my head, it’s hard to shake it loose, so I had another thought. What if I rewrote the fic but added in the canon elements that are missing, essentially re-engineering the fic? My brain went all tingly, which is a good thing. I am leaning heavily towards the fic re-engineering even though a month is a short amount of time to get a story written, edited, and polished, but it would be more of a challenge than churning out another bag of words. Apparently there are a lot of recipes for homemade soda, and most are pretty much the same. You need a sweet liquid (I used and apple juice “cocktail” that’s partially juice and partially sugar water) a pinch of yeast, and a sturdy bottle. If you use bottled juice, be sure to check the label. If it contains potassium sorbate, sorbic acid, sodium benzoate, or benzoic acid, then it won’t work. These are additives used to prevent fermentation and will simply kill the yeast before it has a chance to work its magic. The bottle and the yeast are the most important things, the bottle has to be sturdy enough to contain the gases produced by the yeast and not explode (home-brewers call these “bottle bombs” and it’s a bad thing.) 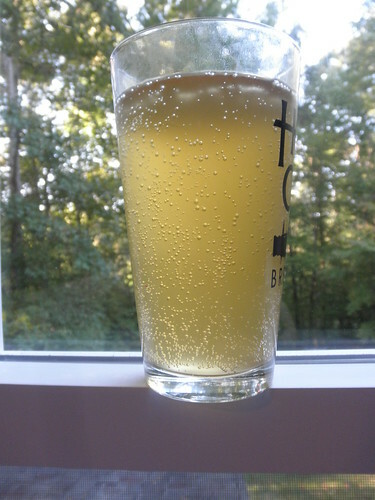 Not surprisingly, soda bottles work pretty good, but since I didn’t have any, I just poured out a bit of the “cocktail” and dumped the yeast into the juice bottle. I then put it in the bathtub with the shower curtain drawn in case of catastrophic failure. I always expect catastrophic failure. The recommended yeast is ale yeast, since I didn’t have any I used a pinch of cuvee wine yeast. Some recipes called for champagne yeast, which sounds silly to me. That stuff has been bred for high-pressure environments and would almost guarantee that things would go boom, but ale yeast will supposedly die off if the pressure gets to high. You don’t need much, just a pinch, so the packet of yeast will last a long time. I dropped the pinch of yeast into the “cocktail” bottle, closed it up tight, and put it in the bathtub before heading off to work. I thought about leaving a note for Mother Dearest, but wasn’t sure what I should write – “Don’t worry if you hear an explosion coming from my bathroom, it’s just the apple juice in my bathtub.” just sounds kinda weird. I got home and the bottle was fine, it still had a bit of give to it so I left it on the counter and checked it several times during the next day. I could see tiny bubbles rising – a sure sign of fermentation – and the bottle was growing steadily tighter. Once the bottle was hard as a rock, after about forty-eight hours, I stuck it in the fridge. I wasn’t sure if the pressure would kill off the wine yeast, but the could should send them into dormancy. A few hours later I cracked open the bottle to a satisfying “c’hiss” of escaping gas and poured myself a glass. It was delicious, but would have been better if I had used a good juice instead of the store-brand “cocktail” I had. I’m thinking my next batch will be cherry or maybe I will try root beer. I had another strange dream the other night, but it wasn’t really as weird as some of the dreams I’ve had. I dreamt my parents had taken the couch out of my room and replaced it with an ice cream freezer. It looked like this, but was green on the bottom. It was just sitting there, plugged in, but it didn’t have anything in it. (An empty ice cream freezer is a very sad sight.) Since there was no couch, I sat on top of the freezer and watched TV for a while before I wandered out of the room and woke up. The next night I dreamt that I was washing my hands at work and for some reason I couldn’t stop. I was standing there in the ladies’ room, just washing my hands over and over. It was very Shakespearean. When I woke up, Fearless was licking my hand – there was actually a red spot where she had been licking it for so long. Can You ‘Ear Me Now? As part of the ongoing joys of being a pet owner, I regularly clean out my cats’ ears. I’ve got the procedure down pat and it rarely takes very long – a few swipes of a Q-tip and I’m done. The cats tolerate it fairly well, especially since I give treats before and after. They’ll do anything for a treat. I was cleaning out Fearless’ ears, always a hassle since that are as fluffy as the rest of her, and things were going smoothly. I had finished the right ear and was nearly done with the left when Fearless decided to shake her head. I pulled the Q-tip away so that she wouldn’t hurt herself, and saw that the cotton tip was missing. I had my hand on Fearless’ shoulders to hold her still, so I clamped down at once. She had her ear folded down and was vigorously shaking her head. I managed to hold her head still and peer into her ear – I could just see a tuft of white sticking up. I couldn’t grab it with my fingers, so I picked the cat up and headed to the bathroom to get my tweezers. Fearless, who is usually a fairly placid cat, was beginning to panic. Totally understandable in the circumstances, she could feel this thing in her ear and all she wanted to do was get it out. I was afraid if I let her go that she would run off to a hiding place and start scratching at her ear, possibly pushing it further into the ear canal, so I was fumbling around with her tucked under my arm like a very large football while I looked for my tweezers and a small flashlight. This was the easy part. Once I found my tweezers, I had to figure out a way to hold Fearless immobile while I plucked the cotton from her ear. This involved me sitting cross-legged on the bathroom floor with her in my lap and more or less wrapping my body around hers with a flashlight held in my teeth. I flipped back her ear and carefully plucked the cotton out like it was an errant eyebrow hair, checking to make sure it was the whole tip and that no stray bits were still in the ear. I released Fearless, who promptly sat down and scratched her ear before accepting the treats I offered. I watched her for a bit to make sure she wasn’t exhibiting any signs that there was something left in her ear – head-shaking, scratching, that kind of thing – but I figured she was fine when she curled up to take a nap. I guess she had a hard night. 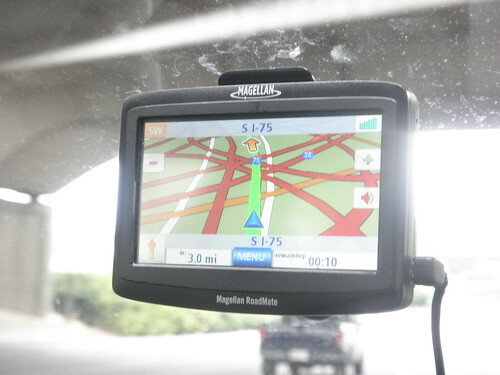 MD asked me to take a specific photo one day, she wanted a picture of the GPS at one point on the freeway into Atlanta. Some of those are train tracks passing overhead, but still – this would not be a good place to break down. While out thrifting during our vacation, MD and I found a little play tent. Naturally, I wanted to pitch it once we got back to the hotel. 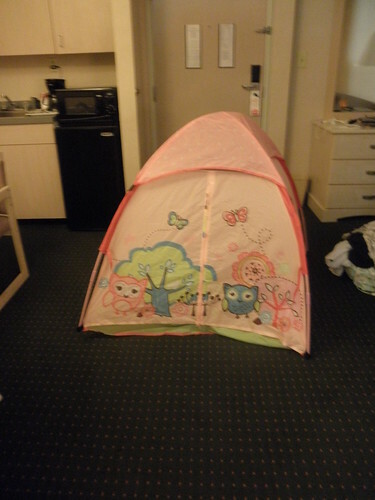 I can now say with confidence that I know how to set up camp in a hotel room. Also, I kinda want to take this with me to the con next year. There were times when I could have used a little private napping space. 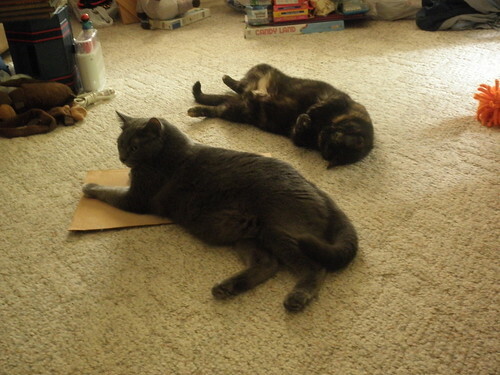 For reasons I am not aware of, there is a flat piece of cardboard in the middle of the living room floor. I assume GD had something to do with it, because I know him. This piece of cardboard has not been altered in anyway to make it more attractive to the cats, such as being rubbed with catnip, but they find it irresistible. 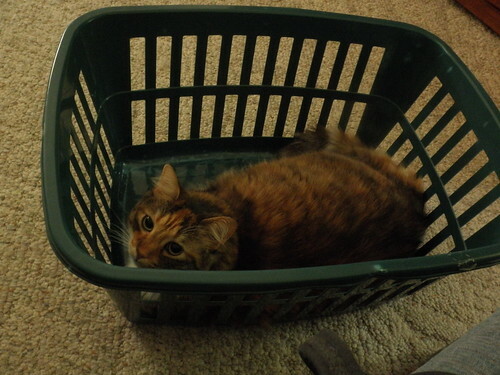 If you are wondering where Fearless is, she had been cuddled up between the two but she hopped into a laundry basket beside me right before I took the above picture.